If you think Samsung is done with the exciting announcements for the first half of 2019 after releasing the Galaxy S10 flagships, you're mistaken. The company continues the steady stream of releases with phones from its A line. And while some of them are rather bland, like the Galaxy A70 and the Galaxy A50, the next Samsung smartphone might be a sight to behold. 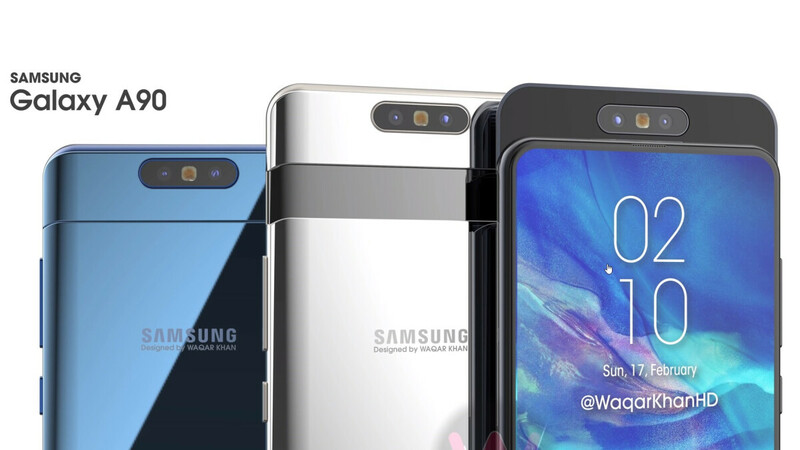 We've already seen some leaks of the Galaxy A90, some even suggesting it might actually be called the A80, but nothing has been as high-quality as the renders provided by Waqar Khan. Of course, these are probably not 100% accurate, but they have the approval of the infamous Ice Universe who said that the video is "Almost completely correct." The "almost" part is a missing Time-of-flight sensor missing from the camera assembly, according to the leaker. ToF cameras are used for better depth of field perception, which in smartphones usually means a more advanced bokeh effect. But enough talking, time to look at the video itself. We're sure at least some of you cringed as they saw the rotating camera module, imagining all sorts of bad scenarios in which it gets jammed, stuck, broken and ruins not only your day but potentially your whole month. And while those are valid concerns, we can't deny it looks cool. Granted, that is just a render, but the real deal shouldn't be much different, as stated above. It's not the first time we've seen cameras pop up from behind the display, but this is the first time that we see that little flip. Sure, that does introduce another weak point to the phone, besides the sliding mechanism, but both come with some benefits as well. 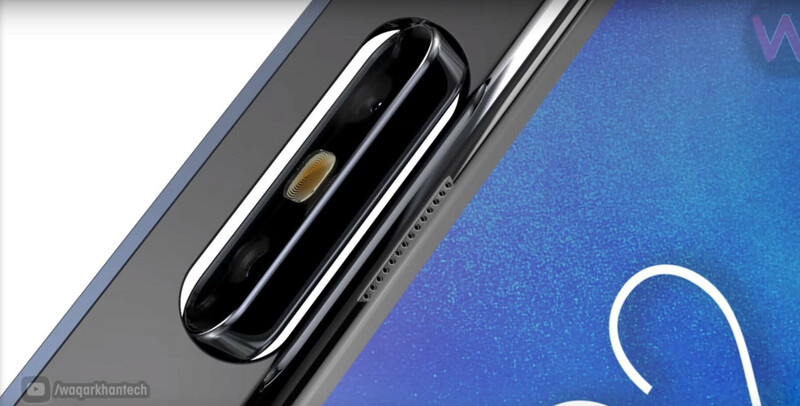 The sliding part allows the display to get rid of the notch, which tear-drop or not, is a "feature" we'd rather go without, and we're not alone. This leaves the whole front panel of the phone for the display to stretch on and it does, with the bottom bezel having just a couple of millimeters added to its thickness, as we've come to expect. The Galaxy A90 has the clean look we all want, but so far every smartphone that has provided it did so with a compromise, and in Samsung's case it's no different. The rotating camera assembly, on the other hand, means one thing: superior selfies! The main sensor is rumored to be a 48MP one, with an 8MP one for the secondary camera, which likely have a 2x telelens (or a wide-angle one, nothing sure yet). Besides using the main camera for your selfies, you also get the benefit of the regular flash, instead of relying on the brightness of the screen to make sure your selfies at the club look nice. And lastly, although that's a lesser benefit, you'll definitely also get some looks and questions about your phone when people see all that movement going on when it's time for picture taking. As long as it works, that is. What about the rest of the A90 (A80?) specs? Here things get a bit blurry, largely because of the uncertainty around the name. Not that the number itself matters so much, but because if what we're seeing here comes out as the A80, it will leave a spot for another phone to be the A90, and that's where rumors put the Snapdragon 855. The A80, in that case, will get a chip that is a step down: either one of Qualcomm's mid-range chips or one of Samsung's own Exynos SoC. For those interested in the phone's selfie-prowess, both chips should provide satisfactory performance. The battery is expected to be with a capacity of around 3,600mAh and the RAM/storage combo is most likely to be 6/64GB with a 128GB option available as well. The good news is, we won't have to wait much until we find out not only the real name of this smartphone but its exact specs and design as well. Samsung is having an event on April 10 where this device should be the star of the show. Coool ! Too much work for a selfie though . It doesn’t bother me since I rarely use my my front camera. I think there needs to be a way to do this without a motor. That motor goes and you are down and out in the camera department. As long as the motor is brushless, there shouldn't be any problems for the life of the device. Love it. Sure there are negatives to mechanical parts, but this is an ingenuitive and elegant design for an unobstructed front screen experience (no notches/holes).